Size: 16.5 x 11 inches. 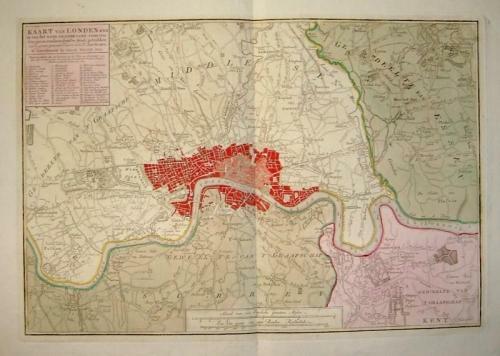 A rare map of London ca. 1754 by Isaak Tirion of Amsterdam. Map depicts London and Middlesex, Essex, Kent and Surrey. Excellent condition, with no marks, creases (other than centre fold), stains, fading, tears or damage of any kind. Measurement of actual printed area 16 1/2" x 11" with a 2-3" outside area for matting and framing.